AGAGO – There was shock in Patongo sub-county in Agago district after children survived death in a fire started by their father to compel his wife to share a room with him. 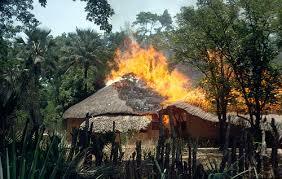 Calvin Odong, 41, a resident of Vietnam village in Patongo sub-county Agago district on Independence eve late in the evening set the grass-thatched house where his children sleep on fire claiming that his wife normally returns home drunk and instead of sleeping with him in a separate house, goes to sleep with the children leaving him alone. Jimmy Patrick Okema, Aswa river region police spokesperson confirmed the incident and said it was fortunate that the children had not entered the house to sleep but unspecified amount of property was lost in the fire. He said Odong alleged that his wife who is a drunkard comes late every night and sleeps with children instead of joining him in his room; that is why he burnt down the house. The police arrested Odongo and are keeping him at Patongo police station where an arson charge has been preferred against him.